It is never as simple as it seems! I love a script that draws you in with its charm and apparent simplicity and then goes further and gets more complicated with each step. It is the sign of a smart and skilled playwright and this is a great example. Grahame is delighted to be back on the Live Five stage, especially alongside such a wonderful and talented team. He also wants to thank you for coming to see the show! For Live Five: The Edible Woman (Thigh High Theatre/Live Five) and stage manager for Love/Stories (Ball and Chain Theatre/Live Five). Other: Burt White in Dr. Frightful Presents: Dead Air (Canadian Fringe Circuit), Butch in Leading Ladies (Persephone Theatre) and Judas Iscariot in The Black Bonspiel of Wullie McCrimmon (Persephone Theatre). Grahame also sits on the board of directors for both Live Five Independent Theatre and 25th Street Theatre. The nominees for the Saskatoon and Area Theatre Awards were announced today and we are pleased as punch to have been honoured with so many nominations! Jenna-Lee Hyde has been nominated twice for Achievement in Performance, including for Stop Kiss! Gilles Zolty has been nominated thrice for Achievement in Sound Design, including Stop Kiss! 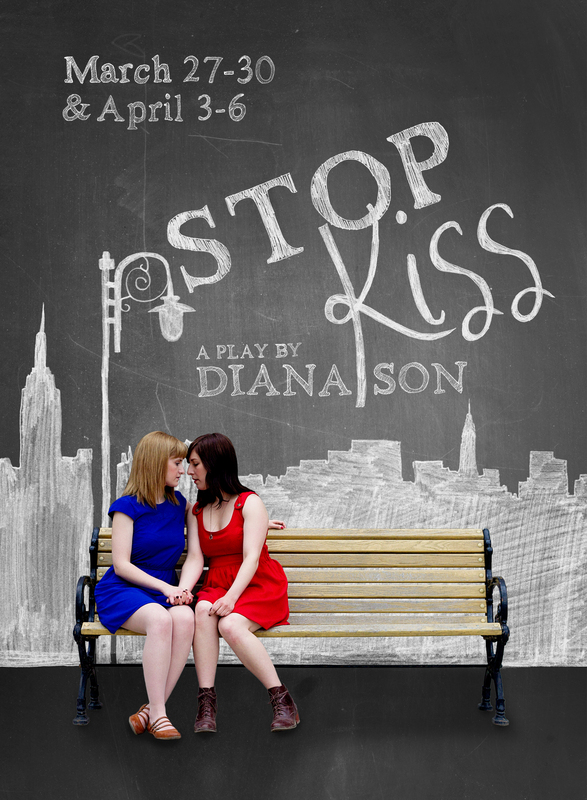 Jenna Maren has been nominated twice for Achievement in Set design, including Stop Kiss! Our Artistic Director Charlie Peters has been nominated for Achievement in Direction for Stop Kiss! 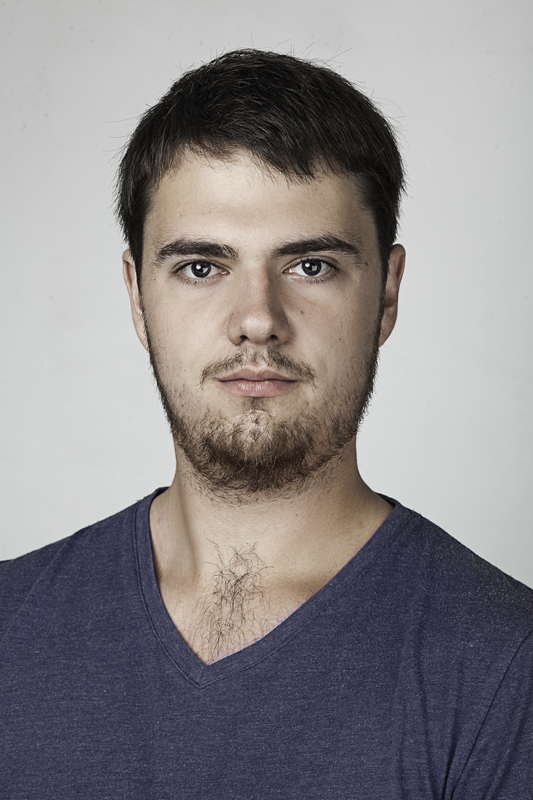 Curtis Peeteetuce (Stop Kiss Ensemble) has been nominated for Achievement in Sound Design! Dakota Hebert (Saskatchewan Outdoors Ensemble) has been nominated for Achievement in Performance and Outstanding Emerging Artist! Shelby Lyn Lowe (Saskatchewan Outdoors Ensemble) was an assistant costume designer for Leading Ladies, which has received a nomination for Achievement in Costume Design! Angela Kemp and Jenna Maren (Stop Kiss Ensemble/Designer) have both also been nominated for Outstanding Emerging Artist! What a gift it is to have worked with such a long list of nominees and such a terrific group of people. Congratulations! A full list of this years nominees can be found by clicking here. Dakota Hebert (Co-Creator/Actor) was born and raised in Meadow Lake. 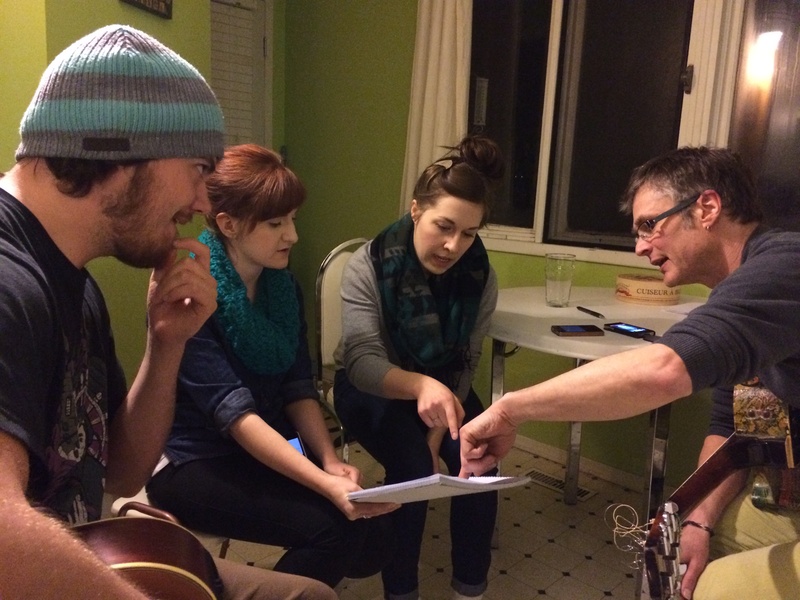 Her theatre career began in Saskatchewan and has taken her across the country. Although she has seen the beauty within the other provinces, they can’t quite compare to Saskatchewan’s outdoors. 1. What is your favourite childhood memory about being outdoors in Saskatchewan? My favourite memory would be anything on the farm. Catching frogs in the dug out with my Uncle Leonard, catching grasshoppers, fishing (I could fish forever), hopping on calves with my cousin Cole and trying to ride them for eight seconds. Bottle feeding calves. Hide-and-seek in the dark. Climbing bales. 2. What has been the most challenging part about working on ‘Sask Outdoors’? 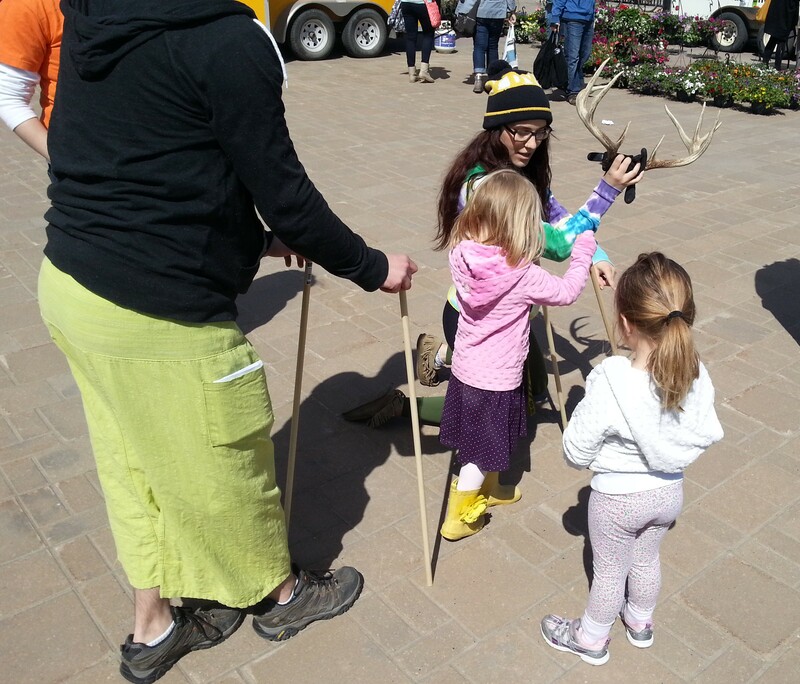 Dakota teaches children about puppets. Not getting homesick. I’m from Meadow Lake, and it is absolutely beautiful in the Spring and Summer. This is probably one of the first summers where I haven’t spent every weekend back. Don Kerr’s poems about driving and small towns make me want to cry every time I read them. They make me so homesick. 3. Why should audiences see ‘Sask Outdoors’? It’s a short, fun play that is completely family-appropriate. Also, all artists involved are Saskatchewan artists, and Saskatchewan based. What a great way to promote our homegrown creators and maybe inspire a few people to pursue their dream careers. 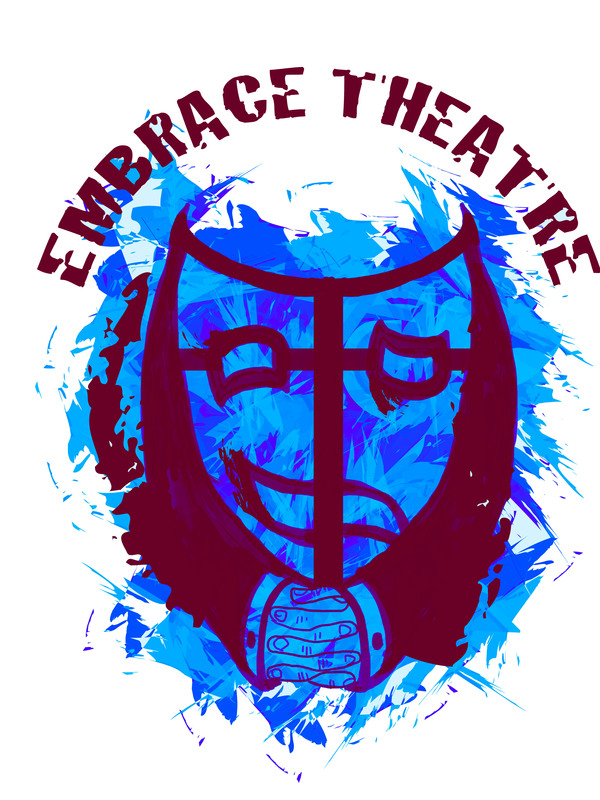 Embrace Theatre is happy to present a workshop by respected actor, director, and teacher, as well as Bard on the Beach founding member Christopher Weddell. 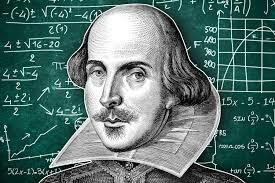 What better way to spend your May long weekend than exploring Shakespeare in this “workout for the actor’s body, voice and imagination.” Both auditing and full-participation slots are available. Click here for more information on this exciting workshop. Curtis is Cree from the Beardy’s & Okemasis First Nation. Since 2001, he has had the honour of working with many talented artists in theatre, radio drama, music and film. Selected highlights include Persephone Theatre (A History of Breathing, Bannock Republic), SNTC (Where The Blood Mixes, Thunderstick), CBC (Out in the Cold, Red Moon) and Rabbit Fall, season 2. Curtis is the recipient of the 2012 Saskatoon & Area Theatre Award for Outstanding Male Performance. He dedicates all his efforts and accomplishments to his beautiful son Mahihkan. Special thanks to family and friends for years of support! What about this play resonates with you? I am quite fond of the storytelling style. Any piece of work which dares to tell the story in an unorthodox fashion – particularly beginning, middle, end – is of particular interest to me. I’m very happy to be working on this piece with this team of artists. What do you do to prepare for a role (or this role specifically)? As an Aboriginal actor, I am usually cast in roles which reflect my ethnicity or look. These roles I am quite adept at preparing for, as I have a strong sense of identity, culture and language. In Stop Kiss I play a New York detective, which I know nothing about. Prepping for this role was a bit of a challenge, which I love, for such challenges can only make us better artists in the long run. What does community engagement mean to you? Community engagement is about opportunity and acknowledgment. Opportunity for storytelling, sharing, dialogue and collaboration. As a theatre artist I am not classically or ‘Westernly’ trained. In one sense this is a detriment, for I have little knowledge about classical theatre and its pedagogy or its great artists. On the other hand, I feel I contribute a valid and important perspective to the arts in our community. That inevitably opens the door for acknowledgment about the diverse forms of artistic expression within our discipline. Born and raised in Saskatoon, Chris is thrilled to be a part of his first show with Live Five and second with Embrace Theatre. 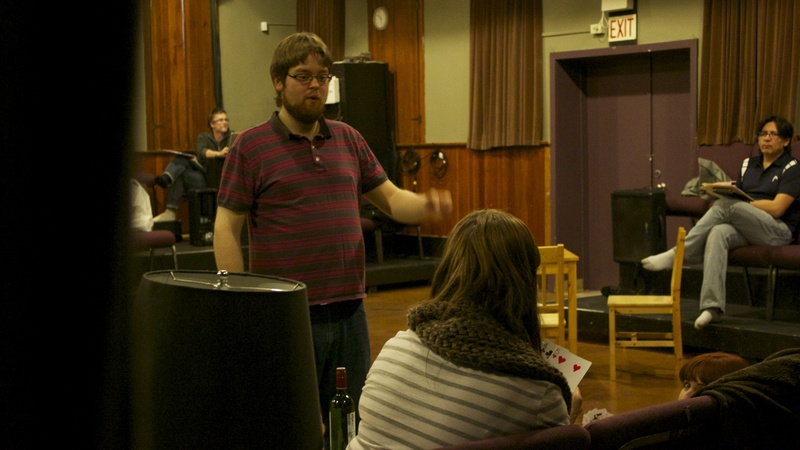 Since receiving his BFA in Drama from the U of S, Chris has been exploring many paths in performance, including voiceover, directing, composing music, as well as singing opera. 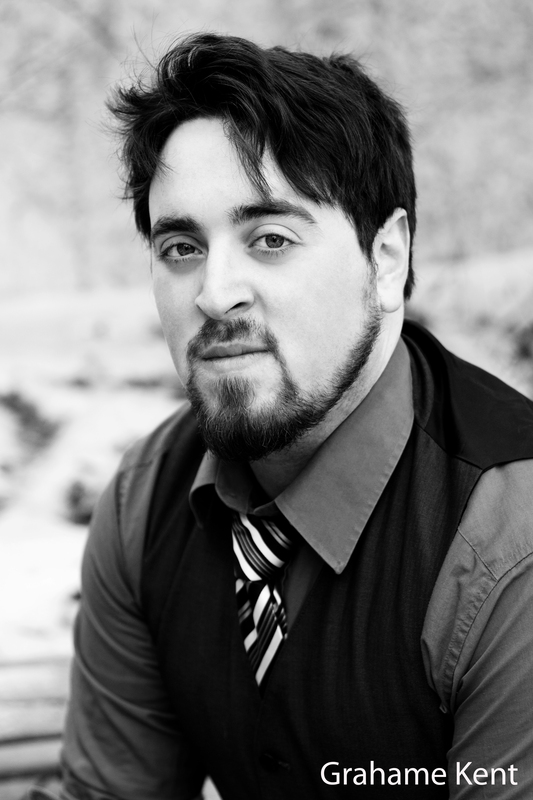 He was previously seen in The Composer is Dead (Saskatoon Symphony), Bottome’s Dreame (Embrace Theatre), Carmen (Saskatoon Opera), and Into the Woods (Greystone Theatre). Upcoming performances include singing in the Saskatoon Music Festival, Candide (Opera Nuova), Saskatchewan Oudoors: A Touring Play for Families (Embrace Theatre) and Blood in the Dust (Neverending Highway). The first thing that resonated was the humour: it wasn’t a typical “set up then punch line” comedy, but rather a human, organic “two people connecting” humour that I know from experience is difficult to write. It was so authentic, that I could immediately believe these two characters would fall for each other, and I was rooting for them getting together right from the opening scene. Then the next scene elapsed, and I was immediately terrified of getting what I was rooting for. The characters are amazing and nuanced, and the story structure knocks me off my feet. What also resonates with me is the depiction of the trials women and the queer community can encounter in the event of being attacked, or simply by being a woman and/or a member of the queer community: It’s very sad, to say the least. As well, the fact that the play focuses on the romance between these two women makes these obstacles even more egregious, as they’re trying to step on their love. However (and this is a favourite part) none of the characters are overtly evil “moustache-twirlers”, which makes these transgressors human as well. There’s a love by the playwright for everyone in this play, even if the characters aren’t so generous with one another at all times. I start with reading the play many times then doing some table work (macro objectives, etc). I then generally over think it, which is to say I dive into what the character thinks of a multitude of things, some of which aren’t even represented onstage/in the context of the play. I usually begin with topics that are important to me, and I try to find common ground between myself and the character: sympathy with my character is key. When that’s established, I move on to key differences between them and me. I then think about how they would move, speak, and react within the context of the play, journal as my character, write a bio, nail down a belief system, etc. Then I hit the point in my process where I decide to stop trying so hard, relax into the character, and just work toward reacting with my fellow actors in the cast. Also, my character is shaped by how my cast mates’ characters are reacting to me: if I take that into consideration I can better fit into the story and contribute to the ensemble. If theatre is about creating resonance between an audience/performer and text, I believe community engagement is about sustaining that resonance beyond the theatre space. We, as artists, tell stories, and I personally know that there are countless stories like that of Stop Kiss in the real world with similar endings to this one. By engaging in the community, we can hope to extend the sensation of rooting for these love stories into the communities in which we live, and to extend the sensation of loss we feel when an attack like the one in the play harms the potential of these relationships.